At one stage, Dawn used to come out with many reasons & excuses to delay going to school in the morning or volunteer to absent herself totally. She can never beat the mommy & daddy with her excuses though. I didn’t really know what had happened to her change of attitude, but was definitely grateful that we can stop dealing with her sudden stomachache saga (trust me, kids at this age always use this same excuse!). It’s only when I get to visit her school one day and I finally know the reason.. 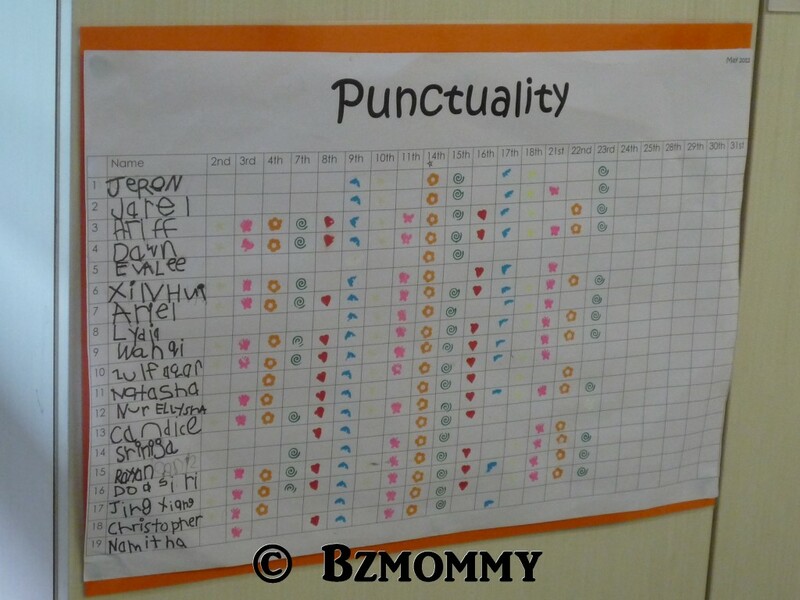 Her teachers started this Punctuality chart and awards each child with a colour stamp each day. The child will naturally miss a stamp if she/he is not present that particular day. And kids being kids, they love to see their row filled with stamps (some adults too have this “symptoms”!)! And the teacher will give them a small reward at the end of the month. Some parents might think this is too early to start for a child, but I will raise my hands (and legs) to agree on having such teaching on punctually to start early. Thumbs up for the teachers!